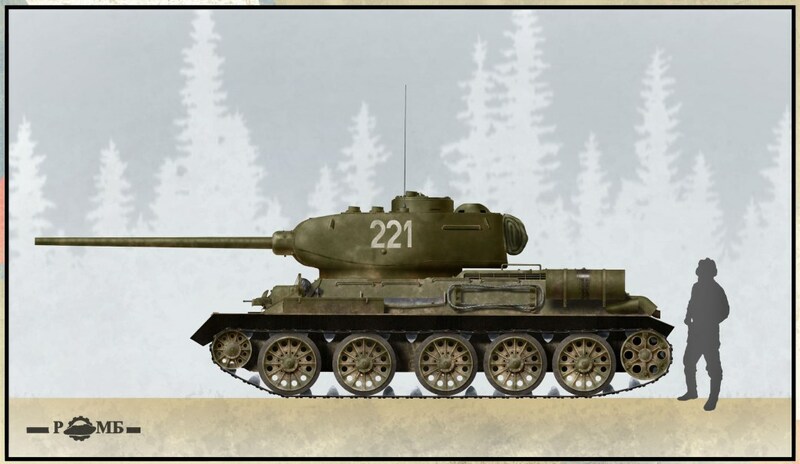 The T-34 was a medium tank produced from 1940 to 1958. Although its armour and armament were surpassed by later tanks of the era, it has been often credited as the most effective, efficient and influential design of World War II. First produced at the KhPZ factory in Kharkov (Kharkiv, Ukraine), it was the mainstay of Soviet armoured forces throughout World War II, and widely exported afterward. It was the most-produced tank of the war, and the second most-produced tank of all time, after its successor, the T-54/55 series. In 1996, the T-34 was still in service in at least twenty-seven countries. Many Warsaw Pact countries also used the SU-100, as did Soviet allies such as Egypt, Angola and Cuba. 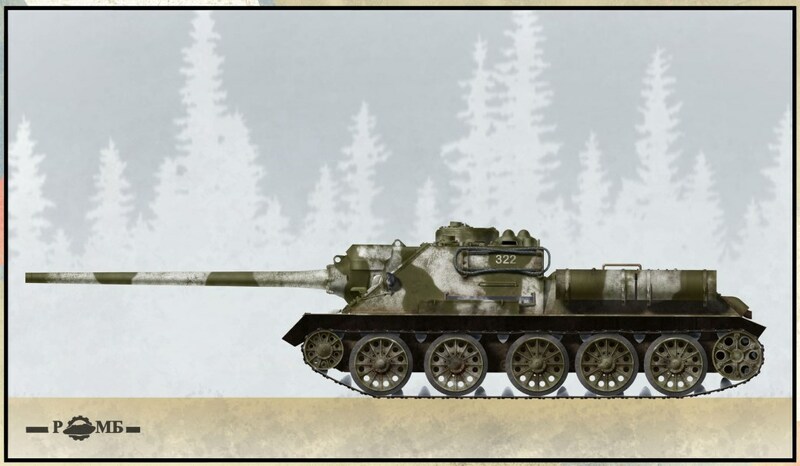 A few SU-100 were delivered to Yugoslavia after the war, under the designation M-44. 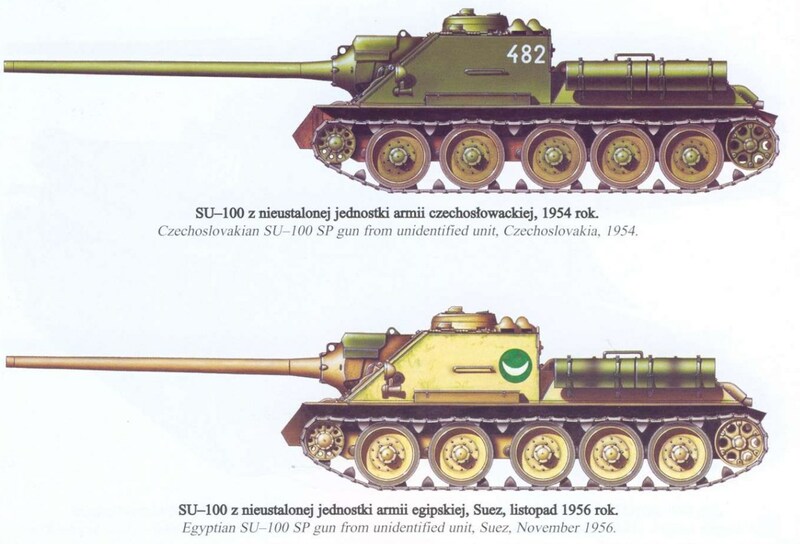 The SU-100 saw service in the fighting that accompanied the 1956 Suez Crisis, in which the Egyptians used SU-100s against Israel’s M4 Sherman tanks. The vehicle was also utilized in the 1967 Six-Day War and the 1973 Yom Kippur War. It was modified slightly to adapt it to the sandy conditions of the Middle East, thus creating the SU-100M variant. Exported SU-100s continued in service until the 1970s, and in some countries, even later. Yugoslavs used them during the civil war; however, due to lack of spare parts they were quickly retired, despite their satisfactory performance. The SU-100 remains in use by the Vietnam People’s Army and the Korean People’s Army Ground Force. SU-100s entered service with the People’s Liberation Army (PLA) of China after 1 December 1950 when Soviet forces left Dalian. The armaments in Dalian were sold to China, including 99 SU-100s, 18 IS-2 heavy tanks, and 224 T-34s, with which PLA formed its 1st Mechanised Division. In April 2015, a SU-100 self-propelled gun was photographed being used in Yemen as part of the ongoing conflict. Despite Hitler’s defeat in Europe, the T-34 continued to see combat in the Far East throughout the closing days of the Second World War. In August 1945 it was in the forefront of the Red Army’s invasion of Japanese-occupied Manchuria, which took the tanks into North Korea. The Red Army under Zhukov had fought the Japanese in Mongolia in 1939, but the subsequent truce had enabled the Soviets to concentrate on defeating the Nazis in Europe. Stalin, though, had unfinished business and his tanks simply steamrollered their way through the ill-equipped Japanese forces. The latter had nothing capable of taking on the T-34/85’s armour and the Red Army cut through the Imperial Japanese Army like a knife through butter. Quite remarkably, after the Second World War the T-34 remained in service for almost another five decades. On 25 June 1950 the North Korean People’s Army attacked South Korea, its forces spearheaded by 150 Soviet-supplied T-34/85s. These were superior to anything else in theatre at the time. While 120 tanks were deployed with the North Korean 105th Armoured Brigade, the North Korean infantry divisions’ self-propelled gun battalions fielded a total of 120 Soviet-supplied SU-76 assault guns. In addition to the tanks of the armoured brigade, personnel from the tank training unit at Sadong, with a further thirty tanks, were assigned to the 7th Division. They deployed on the east–central front for the attack on Inje. At first the North Koreans’ T-34s rolled all before them – at least until American M26 Pershing tanks armed with a 90mm gun arrived. In the early stages of the fighting the North Koreans also used their tanks in built-up areas to some considerable effect, neutralising UN defenders. The UN forces were to dub them ‘Caviar Cans’. During the assault on Taejon they moved in pairs or singly, carrying supporting infantry. Afterwards the North Koreans began to use their armour much more circumspectly because of the improving American counter-measures. After the capture of the South Korean capital, the 105th Armoured Brigade became known as the 105th ‘Seoul’ Armoured Division and it was strengthened with the addition of the 308th Self-Propelled Artillery Battalion. By 1953 the North Koreans had seven tank regiments (104th–107th, 109th, 206th and 208th). During the battles for the Pusan pocket the North Koreans received reinforcements that included another eighty T-34/85s; these equipped two new tank units, the 16th and 17th Armoured Brigades. Some were also sent to the 105th Armoured Brigade, but the UN’s air supremacy meant that many were destroyed before they could reach the front. UN estimates at the end of September 1950 were that the entire North Korean T-34 force (then believed to stand at 239 tanks) had been destroyed, whereas the UN forces had lost only sixty tanks. The Chinese People’s Liberation Army enjoyed something of a windfall after the Soviet forces withdrew from Dalian on 1 December 1950. The armaments in Dalian were sold to China, including 224 T-34s and SU-100s, and 18 IS-2 heavy tanks. From these the PLA formed its 1st Mechanised Division. After the Second World War the T-34 was also deployed to keep the Soviet bloc together. Having fought so hard to clear the Nazis from Czechoslovakia, Poland, Hungary and Romania, Stalin had no intention of relinquishing control. In 1953 T-34s were used to put down revolts against Soviet rule in East Berlin and Poland. 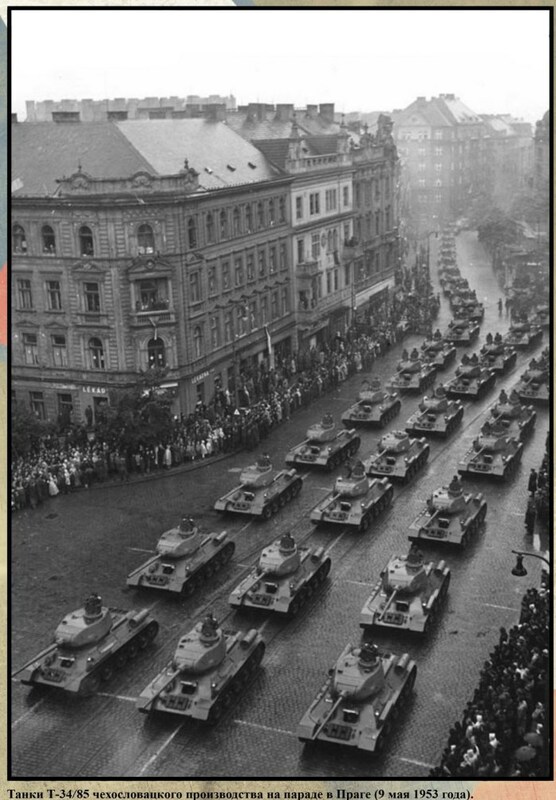 Three years later T-34s rolled into Budapest to help crush the Hungarian rising. 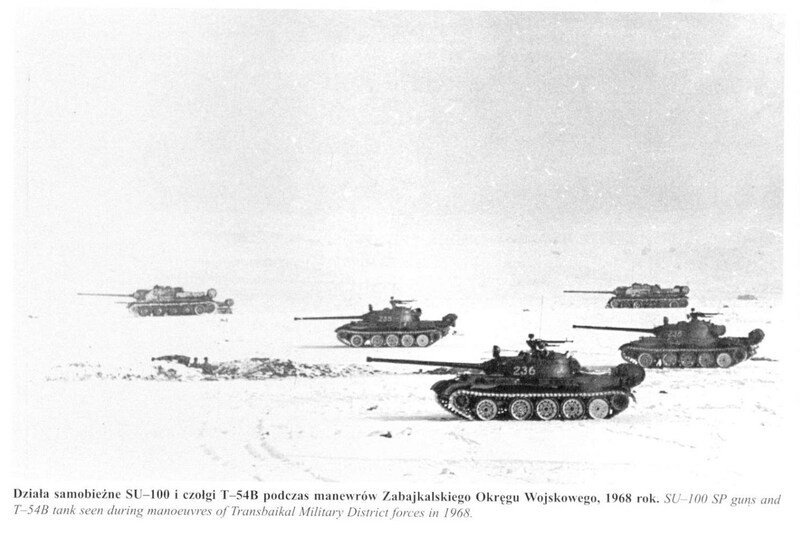 Although successful, the Soviets lost forty tanks during this urban battle. 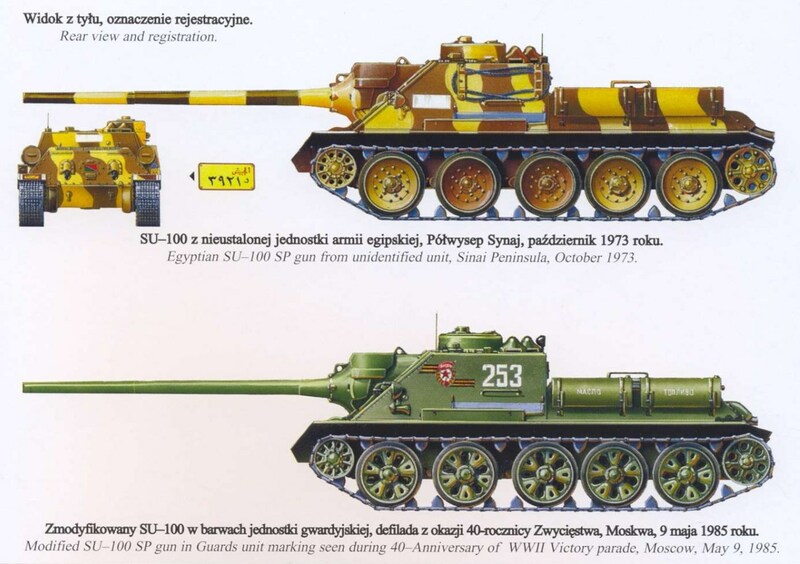 During the 1956 Arab–Israeli war the Egyptian Army was equipped with 230 T-34/85s (which had come from Czechoslovakia), as well as 100 SU-100s. In the Sinai the Egyptians succumbed to superior Israeli training and equipment. 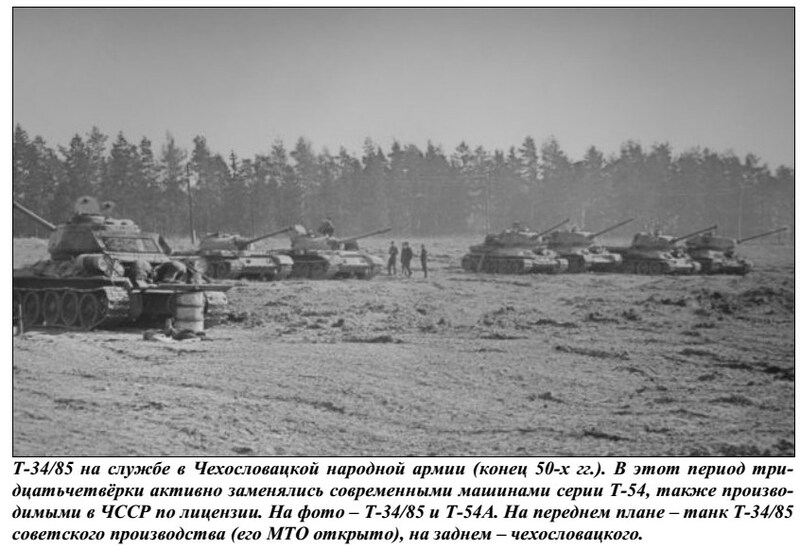 Amongst the vehicles knocked out by the Israelis were twenty-six T-34/85s, one T-34 command tank and six SU-100s. Another four SU-100s were lost to the British during the fighting in the Suez area. By this stage the T-34 was really obsolete but it continued to see front-line service with the Arab armies. During the 1967 Six Day War Egyptian infantry divisions were bolstered with the T-34 and in total the Egyptians fielded about 300 of them. The fighting in the Six Day War was a disaster for the Egyptian Army, whose losses included 251 T-34/85s and 51 SU-100s. Syrian losses on the Golan Heights included seventy-three T-34/85s and seven SU-100s. This was as a result of the Israeli Army having greatly modernised its tank fleet. Despite these losses, the T-34 again saw action during the War of Attrition and the 1973 Yom Kippur War. The T-34 also saw combat in post-colonial Africa. In 1975 Cuban troops supported by eighty T-34/85s arrived in Angola to back the Marxist MPLA against their UNITA and FNLA rivals. The T-34 served during the wars in Ethiopia, Mozambique and Somalia in the 1970s. 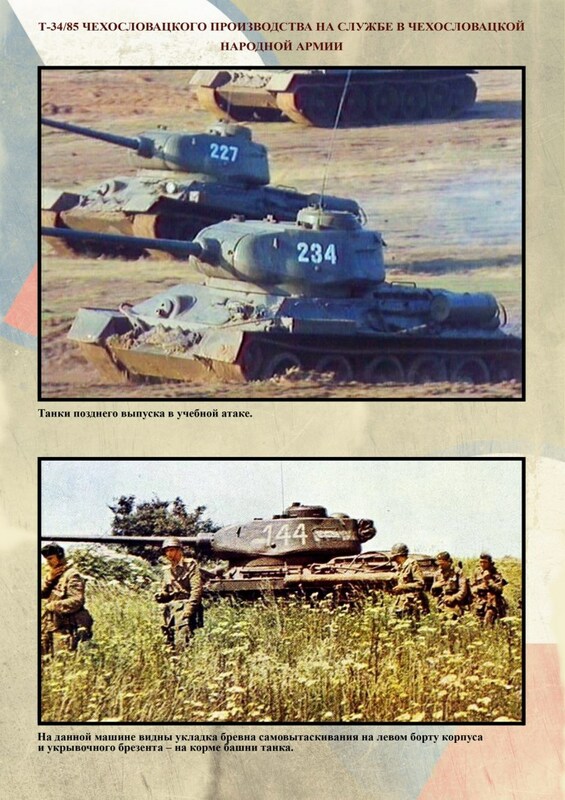 Even in the early 1990s the T-34/85 was still in use with the Croatian and Serb Armies during the wars in the Balkans following the break-up of Yugoslavia.